Departure from Messina at 8:00. Schedule: Departure for Lipari andVulcano. 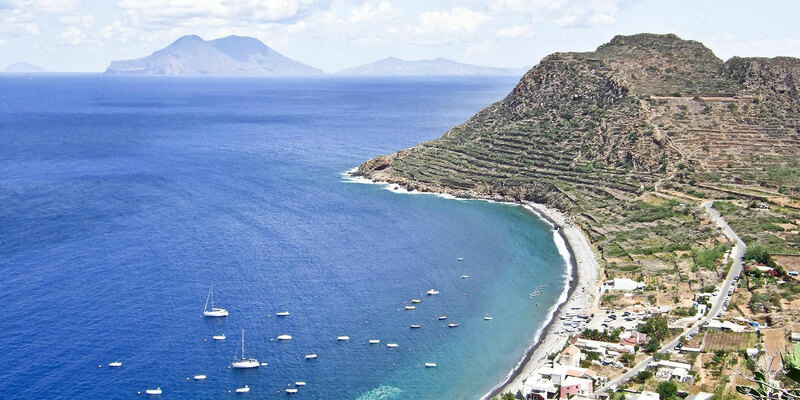 After leaving Vulcano a first stop will be made at Filicudi Pecorini or, alternatively, the boat will stop out at sea to allow passengers to go for a swim (conditional upon adequate weather and sea conditions). Transfer to the port of Alicudi and view of the wonderful Scogliodella Canna, the Grotta del Bue Marino and the ScoglioGiafante. Sail around the island of Filicudi and stop at the harbourto visit the town as well as the little prehistoric village of Punta Pecorini. The order of said visits may be subject to variation on the basis of the route preferred by the boat captain. Return to Messina at about 19:30. Children 4-10 yo € 39,00. Any entrance fees to the Eolian Islands are not included. Please note that all boat tours and stops are conditional upon adequate weather and sea conditions.